Among sophisticated collectors and informed curators, the single most sought-after Japanese clay artist is the extraordinarily gifted Fujikasa Satoko. Both visually and emotionally stirring, her powerful and enormously dynamic sculptures have captivated museum-going audiences on three continents. Flouting the medium from which they have been created, these seemingly light-as-air, highly evocative forms have become captivating must-see works prominently installed in major art museums such as the Musée Cernuschi, Paris; Metropolitan Museum of Art, NY; and Walters Art Museum, Baltimore. "It undulates. It swirls. It floats like a ballerina in mid-pirouette. It seems light and airy enough to melt away... and yet is very much a product of the earth." After a nearly four-year wait, this prize-winning young artist, Fujikasa Satoko (b. 1980), has created ten sculptures for her second US solo exhibition, titled Swirling Energy: Sculptural Metaphors by Fujikasa Satoko, which will be held at Joan B Mirviss LTD from May 1 - June 21, 2019. But one might wonder, after such a long span of time, why are there only ten works? Her process is enormously time consuming and fraught with possible disaster at so many junctures. 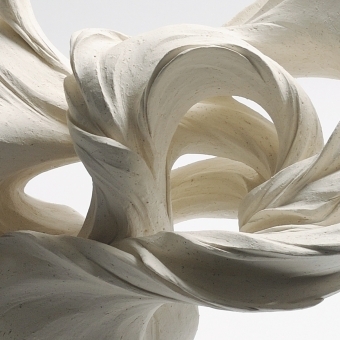 Each fluid and complex form involves many months of creation, as first, a small clay maquette is carefully created based on a series of drawings. The actual sculpture is then meticulously hand built from coils of highly pliable Shigaraki clay that vary in thickness, becoming extremely fine as the form evolves upwards. "Today, there are no other artists creating sculptures through coil-building. The very constraints of the medium of clay and the firing process serve to inspire and challenge her to expand her artistic vision." While working for months on an individual work, Fujikasa strives to evoke the essence of Ki, or life energy, which she likens to the graceful power of a dragon in flight- the perfect metaphor for her sculptures' swirling shapes. As to surface, Fujikasa considers white to be her ideal palette as it is "the color of beginnings and embodies other colors" and that such a pale surface allows her works to be best integrated with the environment in which they are displayed.